Coconut oil strengthens the hair. 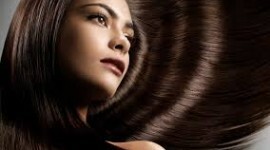 Castor oil gives the hair health and will get longer. Olive oil makes the hair shiny (non-greasy) and almond oil nourishes the hair. Wash your hair with shampoo you use, leave it to dry . Put all the oils in a jar. Mix all the oils together. mix small amounts for longer you should use more oils. until the oil is warm because the warm oil opens the pores of the scalp. If you can leave it overnight this will be more than perfect ..so the oils will work to smooth the hair . .it’s natural relaxer ..Try it and let me know the difference ..
Do this mask at least once a week and you’ll notice the difference quickly. What is best place to buy these oils?